I'm sorry that I haven't blogged for a while. I have been feeling a bit under the weather (nothing serious) but by the time I get home from work I haven't felt like doing much. There are only a few days left for you to grab yourself a free gift. 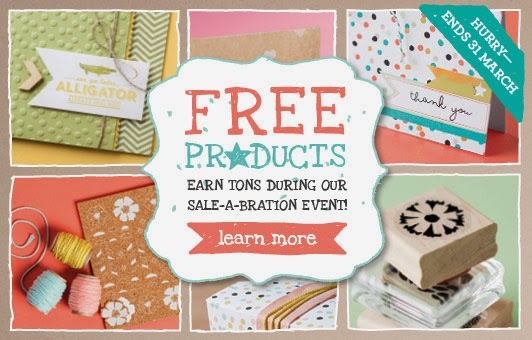 Sale-a-bration finishes on 31st March and the 13 products that are available for free will be disappearing for good. To get a free product you need to order at least £45 worth of products from one of the current catalogues. A link to the main catalogue can be found in the right hand bar of this blog. 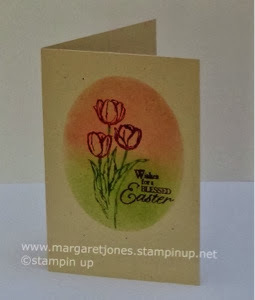 Once you have chosen your products , go to my online shop www.margaretjones.stampinup.net to choose your items. I hope you are all having a good weekend and enjoying the beautiful weather that we are having. Today we were joined by 13 lovely ladies for our craft class in Valley Park Community Centre. 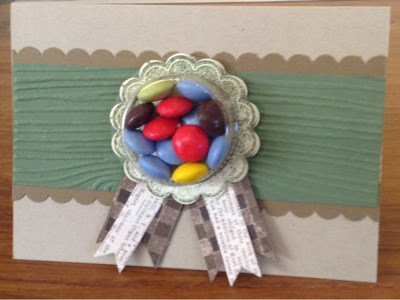 In the morning session Aly demonstrated a beautiful 3D project , a matchbox style box which when opened revealed a garland of flowers which sprung up. 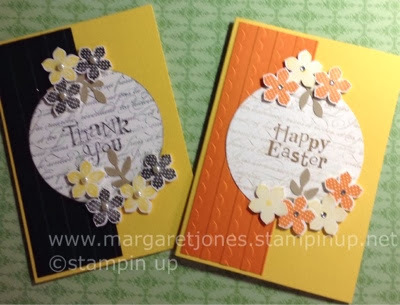 The papers were from the current Sale bration catalogue and are free when you spend stampin least £45 from nod of the current catalogues. The ladies enjoyed making this, some added the letters for a Mother's Day card whilst some left them without for birthday cards. In the afternoon session I demonstrated two cards on the theme of novelty cards. This is one of our ladies, Carols example as when I was taking the photos the original example had disappeared. I think that this is Traceys example along with the Eastet bonnet which was the table gift. Our next craft class at the same venue is on Saturday 26 April. If you would like to join us please get in touch. 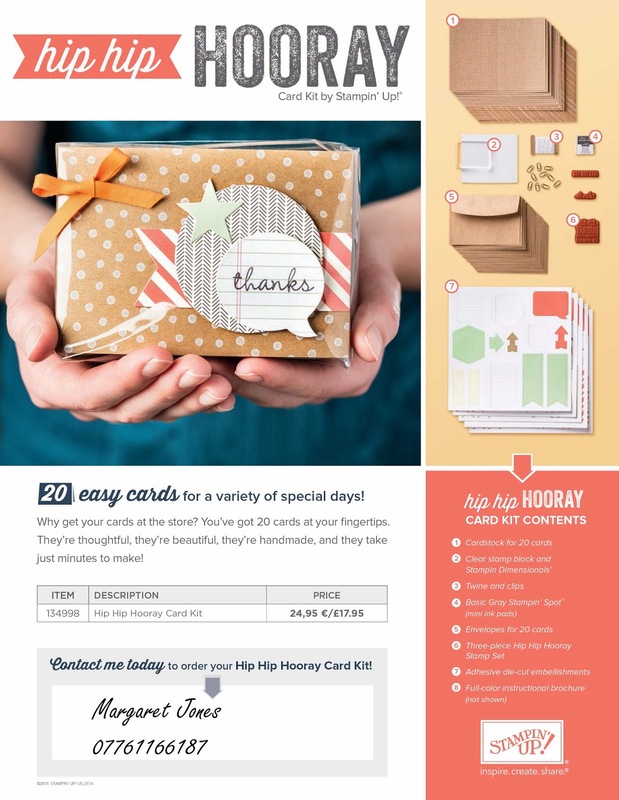 Stampin up have just introduced a new kit which contains everything necessary (minus scissors) to create 20 beautiful cards and it also makes the perfect gift for that creative someone you. You get everything you need to make 20 cards for £17.95. Easy cards at your fingertips. This would make a lovely present for someone who wanted to start crafting but wasn't sure where to start. 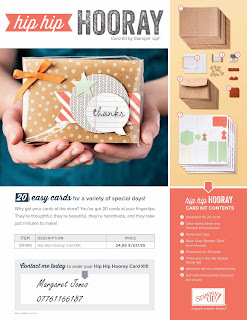 Why shop for cards when you can have 20 beautiful cards ready to go in just minutes? And best of all, they'll be handmade! I used Blushing Bride Cardstock which has been matted with Whisper White which has been embossed with the Mosaic embossing folder. 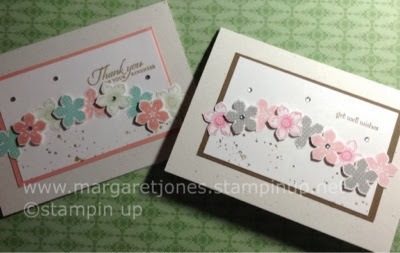 I then sponged each colour around two sides of the card and stamped the Mosaic Madness stampset into a few of the shapes within the embossing folder. 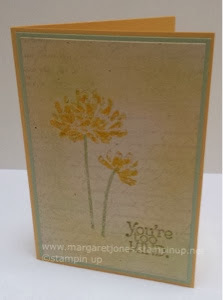 Finally I embossed a sentiment with gold embossing powder. What lovely weather we have had this weekend, long may it continue. 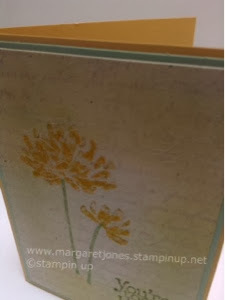 The challenge this week over at Less is More (http://simplylessismoore.blogspot.co.uk) is a one layer card with a theme of Spring Flowers. I always find the one layer cards quite challenging but think that I am getting the hang of them. I hope that you are all having a good weekend. The weather on the South coast has been beautiful and we had a lovely walk along West Wittering beach. 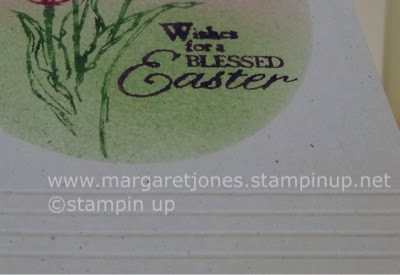 Sale-a-bration lasts until 31 March and this is the best time of the year to join Stampin up. The cost of the starter kit is £99 and this would normally get you £130 worth of products of your choice but during Sale-a-bration you get £150 worth of products of your choice for £99. 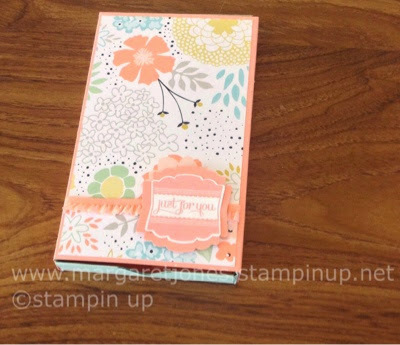 To sign up with Stampin’ Up! you need to do so through another Demonstrator, who is called your up-line. In Europe Stampin up demonstrators are located in France, Germany, Austria, The Netherlands and the UK, so why should you choose me? I’m a optimistic, energetic and willing person who has an enjoyment in creating, inspiring and sharing that with others. 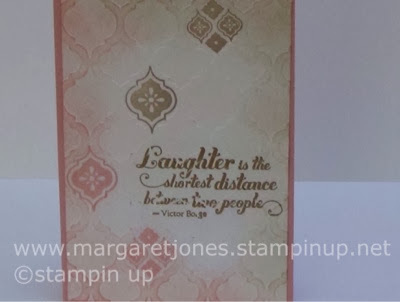 I love rubber-stamping and all of the co-ordinating products that Stampin’ Up! provide. By signing up with me, you would become part of my team and I’ll provide you with all the help and support you need — but I will never pressure you to do anything that you don't want to. Discount demos – those who want to buy for themselves at a discount, to fund their own crafting hobby/habit! Career demos – those who want to build their own business by selling products and hosting regular craft classes and workshops. So there really is a ‘demo’ status out there for everyone. Whether your goals are to just support your paper-crafting or stamping habit, or you want to build a successful business, I am here to help. 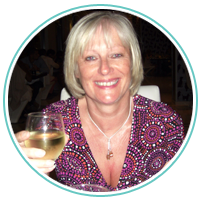 I would love you to join my team for the friendship, support, inspiration and above all, the fun we share. 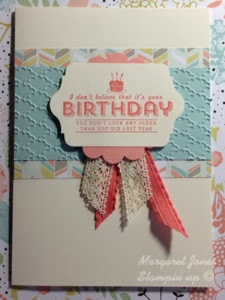 The card that I am sharing with you today is a card that has been blogged before but has been my most visited card on Pinterest. Do you like my new blog design? I decided to have it redesigned as the current web trends are for designs to be clean, fresh and simple making them easier to view on all devices. Last night I held my card class at Romsey. I currently run two classes a month on consecutive weeks , last weeks was in Bishop a Waltham. 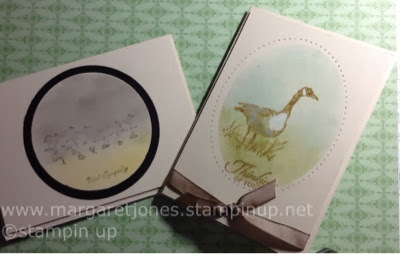 The classes are identical and the ladies take home 8 cards , four designs with two colour variants . 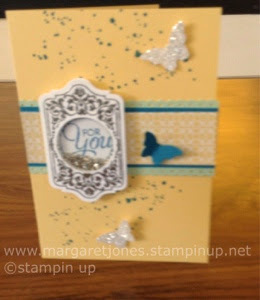 If you would like to join us to make some cards please contact me for further details or see my classes page. 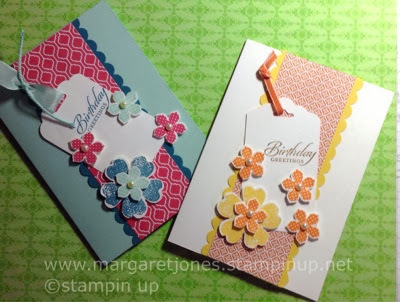 I seem to have been using the stampset Petite Petals from the new Spring/Summer Catalogue a lot just lately . 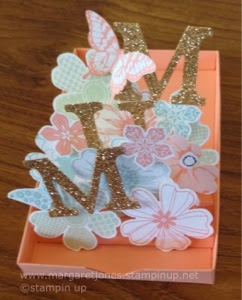 At one of my card classes last week 3 of the four designs used Petite Petals and the ladies loved it. It comes with a matching punch which makes it very easy to use. I cut out a hole from the middle of a doily. 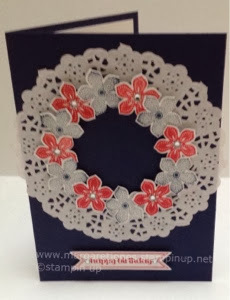 Then I stamped and punched several flowers from the Petite Petals set and using dimensionals I stuck the flowers to the centre of the doily. I added a few rhinestones, made a sentiment and it was done. Hope that you are all having a good weekend. 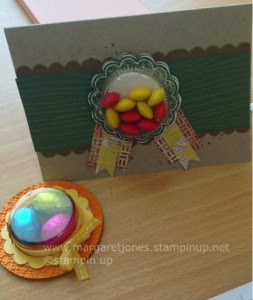 This weeks challenge at Less is More is ( http://simplylessismoore.blogspot.co.uk ) to use the colours green and yellow so I am sure that there will be lots of spring flower cards submitted this week. Yesterday seemed very spring like with lots of sunshine but today it is raining and very cold again . I really like the effect of the En Francais stamped and embossed in clear embossing powder and then gentle sponging to create subtle shadowing.